Moree, New South Wales, AU. (October 9, 2018) BTN — Police have intercepted dozens of Rebels MC members during a week-long operation involving local and interstate officers. The blitz, code-named "Operation Morpheus", saw officers swarm Moree, as the Rebels MC members took part in their club’s national run. But several riders made a u-turn at Moree, and north of the town, after they were met with the men and white in blue, the commander of the club's squad said. 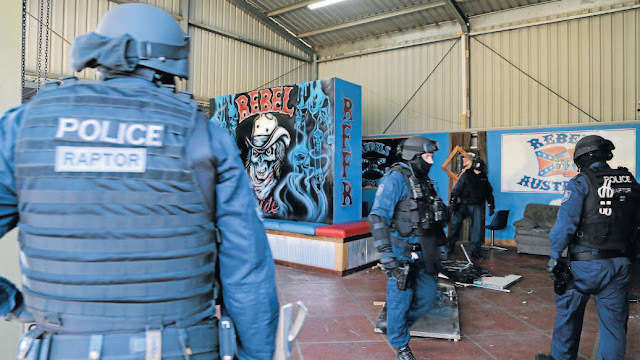 As part of Operation Morpheus, the Criminal Groups Squad’s Strike Force Raptor joined their counterparts from Queensland Police Service and Victoria Police to proactively target the Rebels National Run from Sunday, September 30, 2018 to Sunday, October 7, 2018. Operation Morpheus is a National Anti-Gangs Squad initiative, combining the resources of all Australian state and territory police agencies and key Commonwealth agencies, to detect, deter, and disrupt any illicit activity of motorccyle members and associates. During the operation – which began in Queensland and travelled through Moree, Dubbo, Parkes and Albury – seven people were issued court attendance notices for a range of offences, including possess prohibited drug, possess drug equipment, drive while suspended, assault police, and custody of a knife in a public place. Officers also issued 104 traffic infringement notices and 61 defect notices to several Rebels MC members, and searched 33 people; seizing cash, a knife and prohibited drugs. Criminal Groups Squad Commander, Detective Superintendent Deborah Wallace, said motorcycle club members should expect more operations such as this as interstate law enforcement agencies continue to work together. “We know outlaw motorcycle gangs are not confined to one particular state or criminal activity, and, by working together with our interstate colleagues, it allows us a united front to further disrupt their criminal enterprises,” she said. As part of our proactive strategies, we had several members turn back near Moree to return to Queensland. In fact, attendance for this event was significantly lower than previous years. “As part of our proactive strategies, we had several Rebels MC members turn back near Moree to return to Queensland. In fact, attendance for this event was significantly lower than previous years."